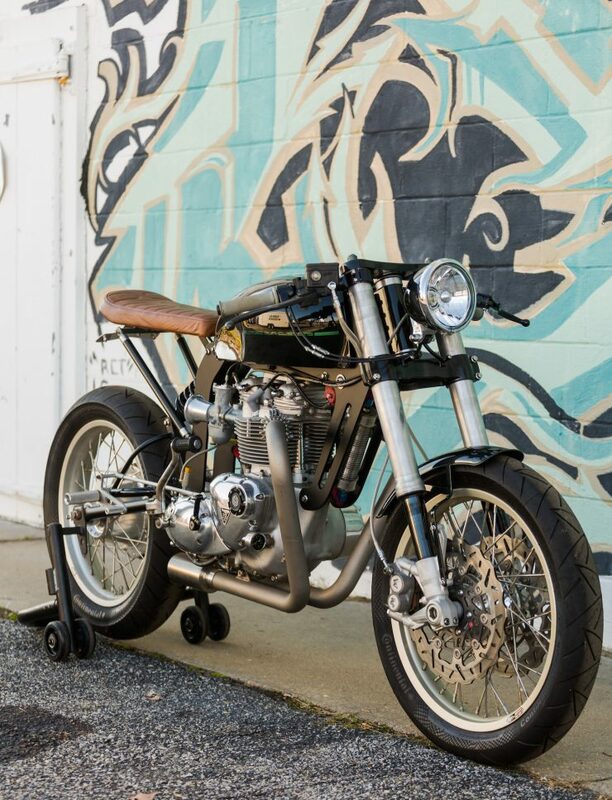 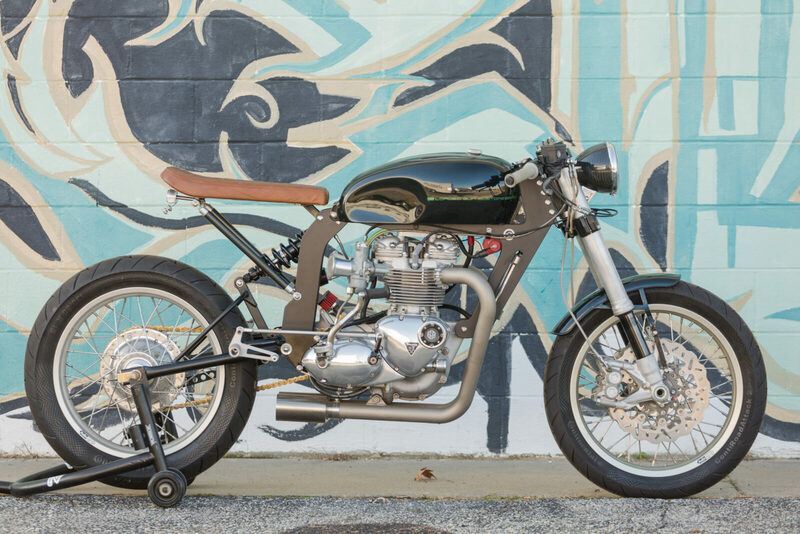 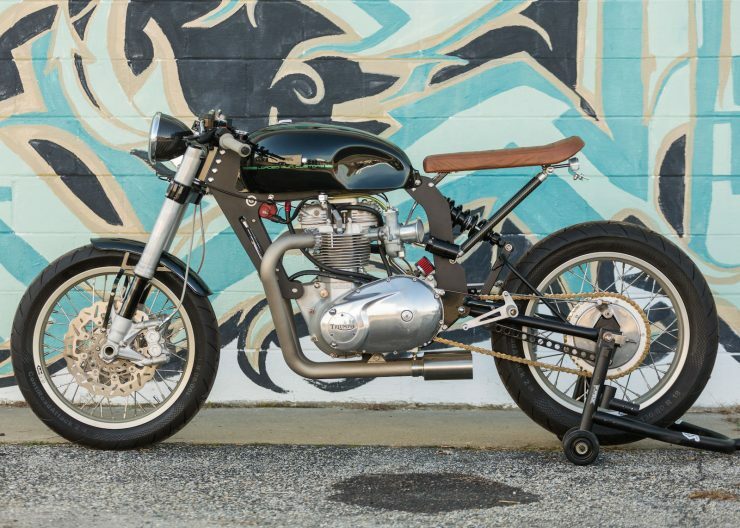 This custom Triumph is essentially a newly designed motorcycle developed by Kevin Dunworth, fitted with a ’70s era Triumph unit-construction parallel twin. 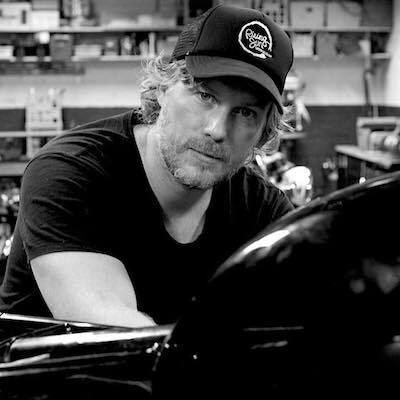 You may be familiar with Kevin’s work, he’s been a highly-influential and celebrated custom motorcycle builder for years, his builds have appeared in many of the world’s foremost motorcycle magazines and websites, not to mention Kevin’s appearances on television with Esquire Network’s “Wrench Against the Machine” and Discovery Channel’s “Naked Speed”. 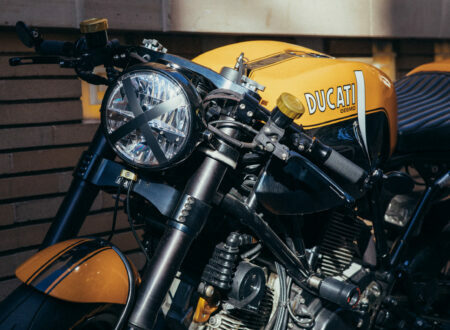 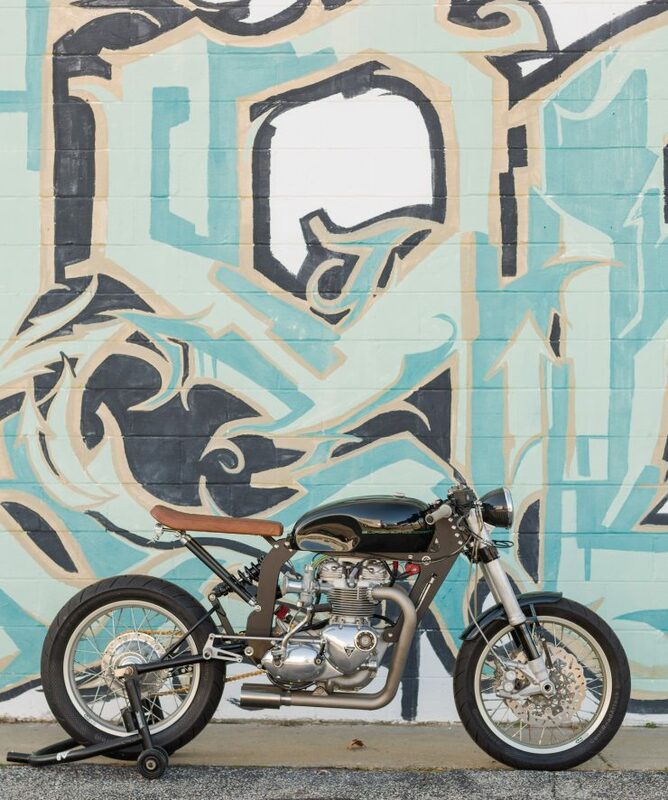 His focus on engineering has always set Kevin slightly apart from most mainstream custom motorcycle builders, his specialty is building state-of-the-art motorcycles around classic engines. 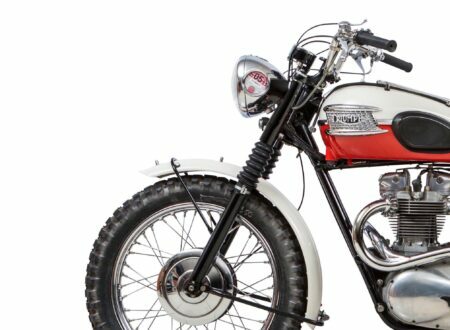 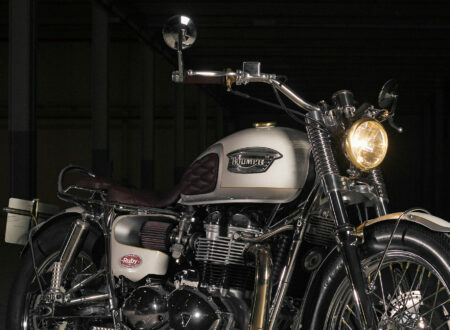 Though this may sound confusing to some, it makes perfect sense when you consider the character possessed by many vintage engines – no one can deny that motors like the Norton Manx single, the Vincent Black Shadow V-twin, and the Triumph Bonneville parallel twin don’t have a personality all their own. 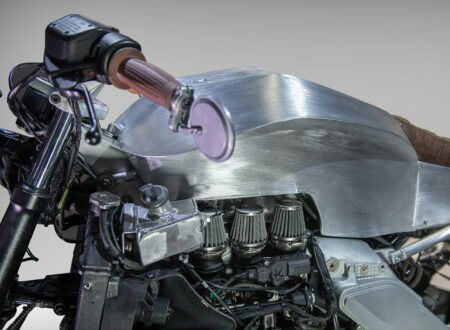 What Kevin does is take that character-filled engine and give it the suspension, brakes, and chassis that allow it to really stretch its legs. 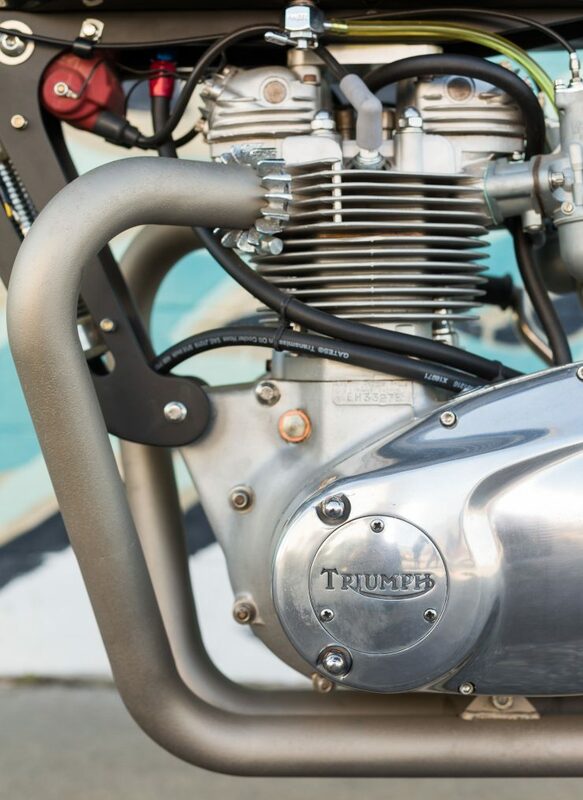 The Dunworth Triumph you see here has a bespoke aerospace-grade 7075 T6 aluminium plate frame developed by Kevin to offer far more strength and rigidity than the original tubular steel frame – at a fraction of the weight. 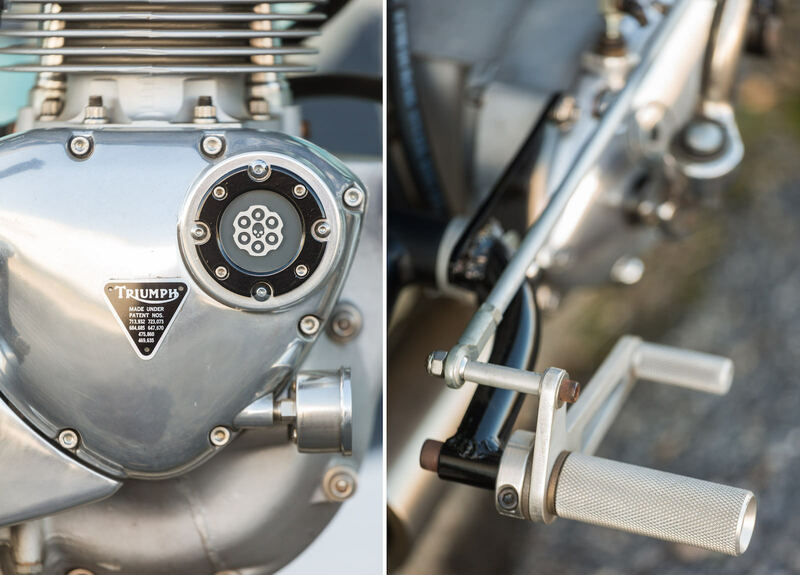 It has three engine mounts, front, top, and rear, resulting in a structure with exceptional torsional rigidity. 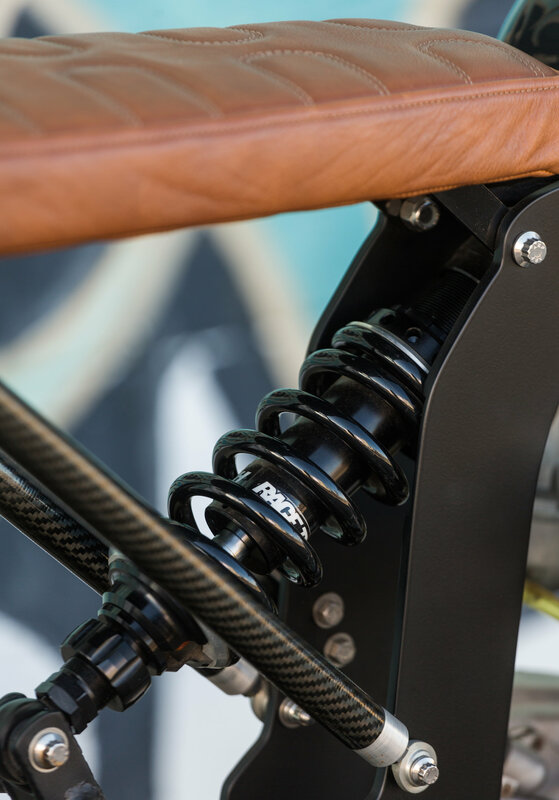 A bespoke tubular steel swingarm rear was developed with an under seat Race Tech monoshock, the top mount of the monoshock doubles as an additional frame strengthening element. 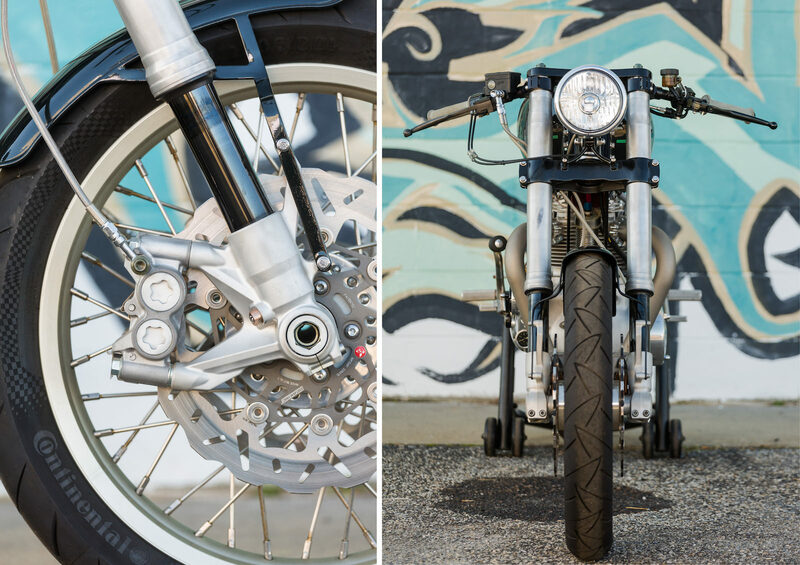 Up front you’ll find a pair of modern upside down forks sourced from a Kawasaki ZX10R with a pair of four piston brake calipers from a Yamaha R1, and Magura wave rotors. The forks are fitted with a set of custom triple trees and topped with clip-ons and a lightweight carbon fiber headlight. 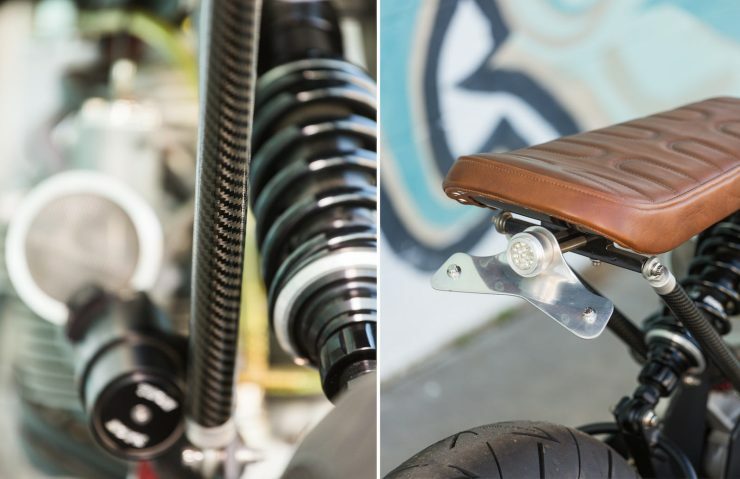 Kevin is currently recovering from a series of serious fractures to his left wrist and shoulder, so this build makes use of a new Magura HC1 hydraulic clutch system to ease left hand strain. 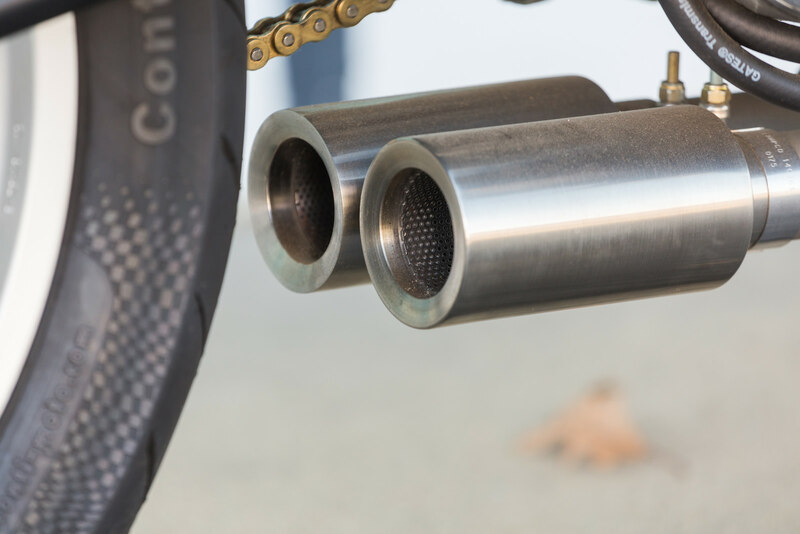 A custom exhaust was made from mild steel tube, they were then ceramic coated and fitted with Cone Engineering under-belly mufflers. 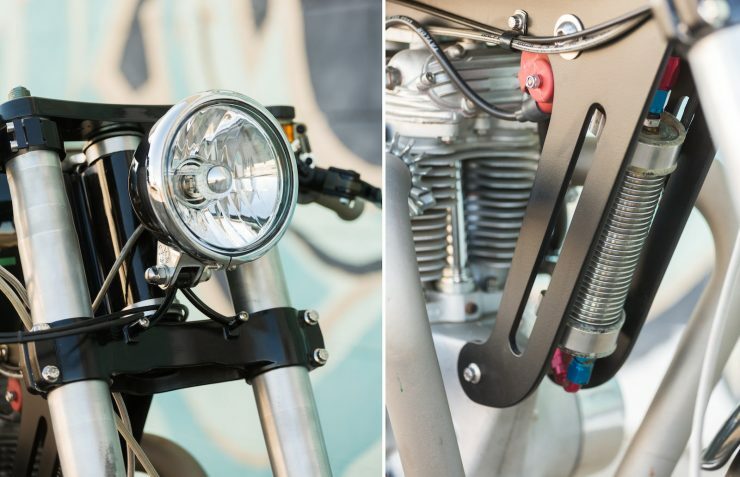 The rear engine plates are used to mount the swing arm, rear engine mount, and the foot pegs. 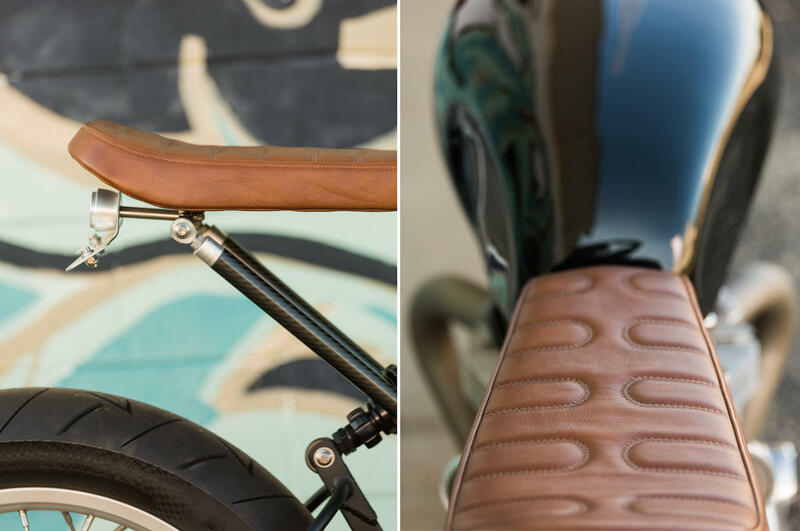 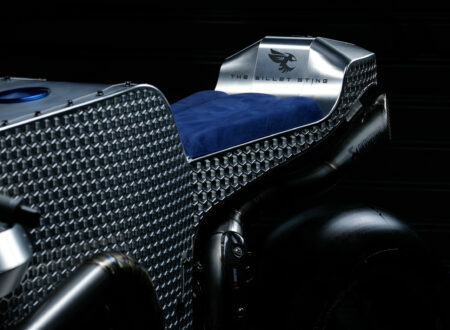 The seat is attached with carbon fiber struts, it has an aluminum base with soft glove leather upholstery and a Boyle Custom Moto aluminum LED rear light. 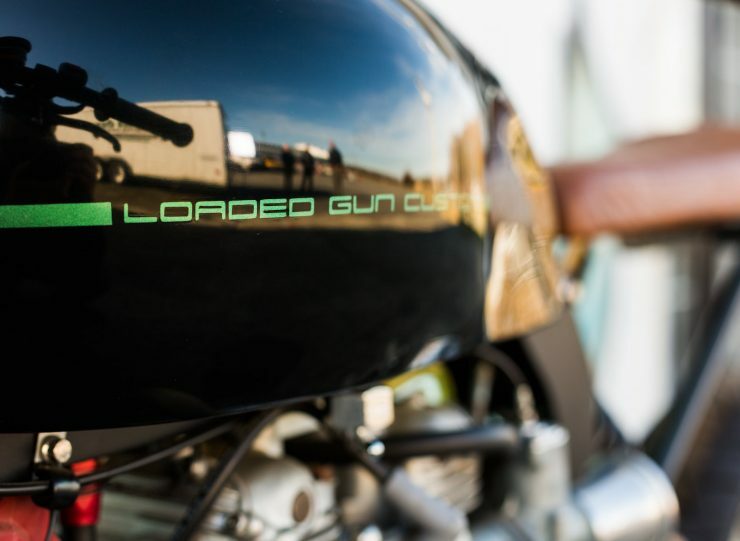 The fuel tank is handmade aluminum, and it’s coloured with an old Porsche shade of green, with a ghosted Porsche font logo. A hat tip to the work of Singer. If you’d like to see more from Kevin or enquire about getting your own custom made you can follow him on Instagram here. 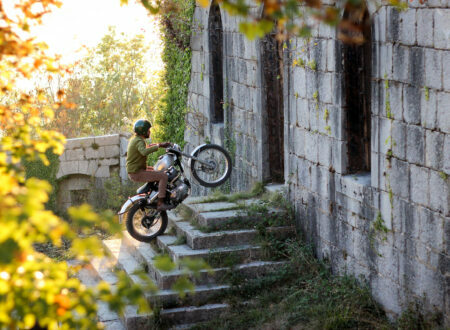 To contact him you can either message him through his profile or email him using the address in his bio.